Dennis glanced at his watch for the 30th time in the past 5 minutes. Now it was finally time for his meeting with the investors. They would call him into their offices at any time now. Dennis looked about the waiting room to see if there were any signs of his hosts. All he saw was the receptionist, deeply concentrated in staring at his monitor. Dennis bit the nail of his right index finger. He ran his thumb over the nail to wipe off any traces of saliva. He came across a piece of loose skin that irritated him. He bit it off and felt the taste of iron on his lips. 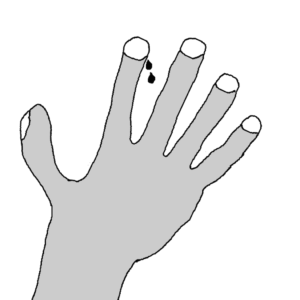 He pressed his middle finger against the index finger to try to stop the bleeding. In vain. The wound was too big.